Tokio Hotel performs to an intimate audiance of only a few hundred at a secret location. Anyone World wide can enter. 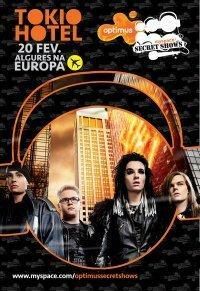 Show us that we are the biggest fan of Tokio Hotel and guarantee your place. Make a video, a music interpretation, show us your collection of the band’s products, that is, be creative and show us that it’s YOU that deserve a place in our plane. Your participation should be send to optimus.lounge@gmail.com until Tuesday, February 16, 2010, at 11:59PM. The concert will be February 20th in a secret location that you will be flown to… imagine, a plane filled with other fans! 2. Show up on the 17th in Expo Optimus Building, in Lisboa midday. The first 30 to get there have ticket guaranteed. The others will have to be creative. It has to be you to be in the Optimus Building, no one can replace you. Attention; you have to be friends of the following profiles on myspace: http://www.myspace.com/optimuslounge & myspace.com/optimussecretshows!